although there is no direct evidence to support it—it was likely that these chords are meant to surround or follow a cadenza improvised by a harpsichord or violin player. The second movement of the concerto is something of an enigma. It consists of two lone chords, with a fermata (a "hold") over the second. Did Bach intend for the performers simply to play these two chords and then move on to the third movement? Or did he intend for one or more of them to improvise a cadenza elaborating on the transition? Musicologists and performers have expressed varying opinions regarding this question. Can anyone shed any light on this? Does this correspond to any earlier concerto practice, or is this completely out of left field? This may help a little. An example from Telemann's harpsichord fantasies. 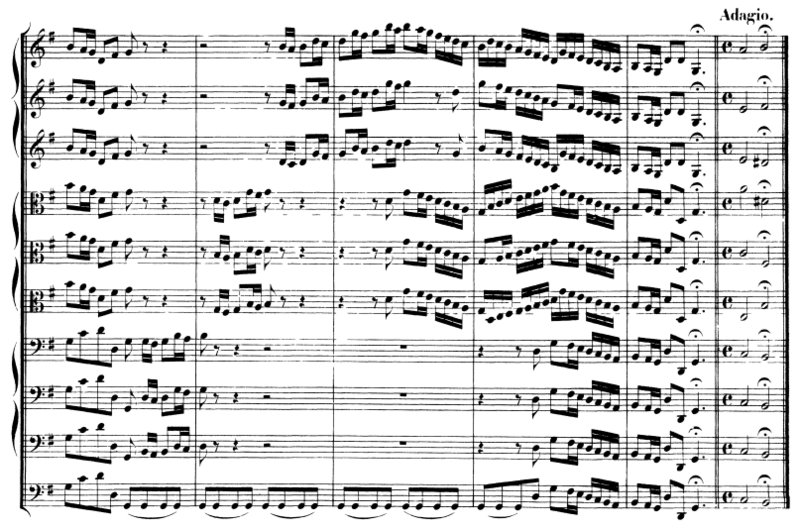 I never thought about this before, but image we had only the last two bars of the 2nd movement. We would have a 1st movement in A major, then middle slow movement giving iv6-V in F# minor (of course that is a half cadence in the relative minor), and then a return to the first movement and A major. This is exactly what the Bach concerto does, except it is shifted down to G major. I know that many baroque pieces have middle, or contrasting, movements that end on a half cadence so as to propel things into the next movement. A lot of Corelli's trio sonatas do it. So the half cadence ending is not a surprise. I suppose this lends credence to the idea that the one bar adagio in Bach was a kind of short hand indicator to improvise something brief in the relative minor ending on a half cadence. It's only one example, but it matches nicely. Not the answer you're looking for? Browse other questions tagged history baroque-period musical-forms or ask your own question. Did Bach intend his two volumes known as the “Well-Tempered Clavier” to be a single work?